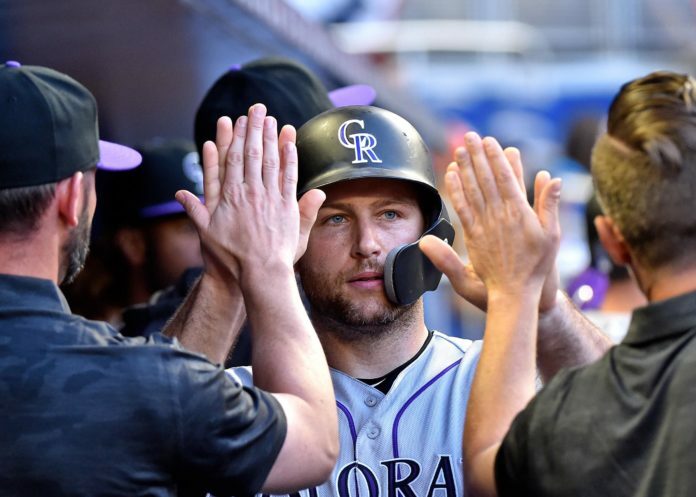 Much like shuffling a deck of cards, the Colorado Rockies made several moves on Monday, partially due to another injury. Chris Iannetta, the team’s veteran behind the plate, was placed on the 10-day injured list with a right lat strain. In his stead, the Rockies called up Drew Butera from Triple-A Albuquerque. Butera was re-signed in late March after joining the club late last season in a post-waiver deal with the Kansas City Royals. In five games with the Isotopes, Butera was 6-for-15 with a pair of doubles. Last season for the Rockies, in only 14 at-bats, the backstop had three hits, including a home run. He is in the starting lineup Monday night against the San Diego Padres. Along with Iannetta’s ailment, the Rockies recalled Antonio Senzatela to start Monday after missing the early portion of the season with a blister infection in his right heel that stemmed from Spring Training. He will be starting in Tyler Anderson’s stead, with the former currently on the 10-day injured list with left knee inflammation. The start will be the first of the year with the Rockies for Senzatela. With the Isotopes, in two rehab appearances, he hurled seven innings, allowed two runs and struck out five. Chad Bettis will also be moved to the bullpen for long relief help with Anderson’s return coming. Joining Senzatela and Butera is Noel Cuevas who will take over the outfield void left with the optioning of Yonathan Daza back to Albuquerque. In his 11 games with the Isotopes, Cuevas was 17-for-45 with three doubles and four home runs. The stint also included a 5-for-5 day in which Cuevas hit for the cycle. In 75 games last season in the majors, Cuevas was 34-for-146 with four doubles and a pair of home runs. He will also start Monday night, hitting sixth and playing left field against Padres’ youngster Joey Lucchesi (2-1, 4.40 ERA). Butera will hit eighth.